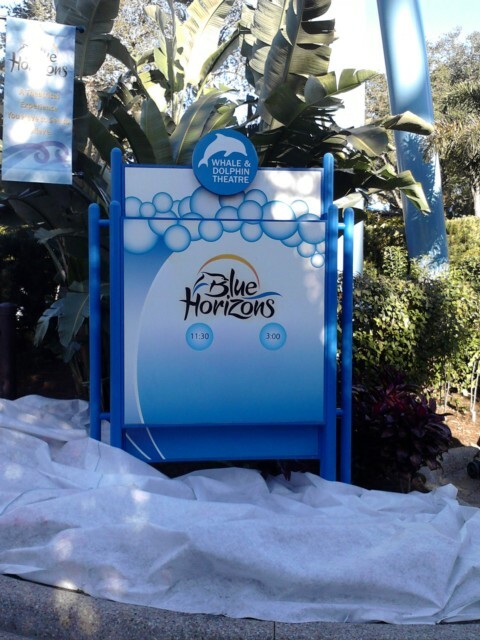 Apparently after the success of Busch Gardens KaTonga the owners of Seaworld tried to duplicate that success with their latest show Blue Horizons and I think they have definitely succeeded. When you enter Seaworld if you go straight to the information desks you can pick up a Park Map with the day’s show times on it. 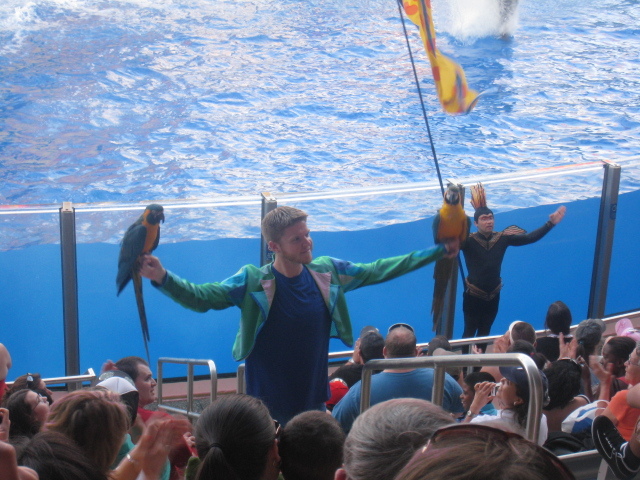 Blue Horizons usually has at least four shows a day depending on the time of year. 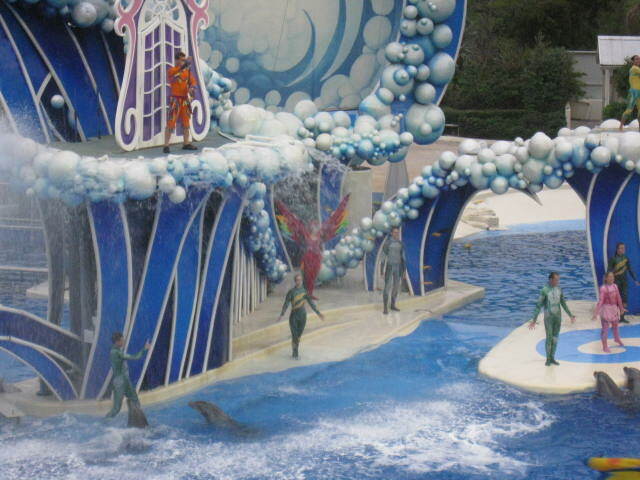 The Whale and Dolphin Theatre show had never been on one of our “must dos” at Seaworld but since Blue Horizons started we have seen it on every visit. 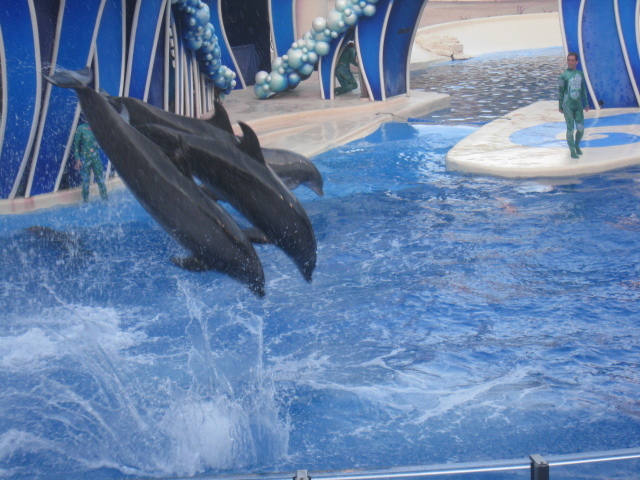 The old Key West design of the Whale and Dolphin Theatre has been completely changed and is replaced by a great set. 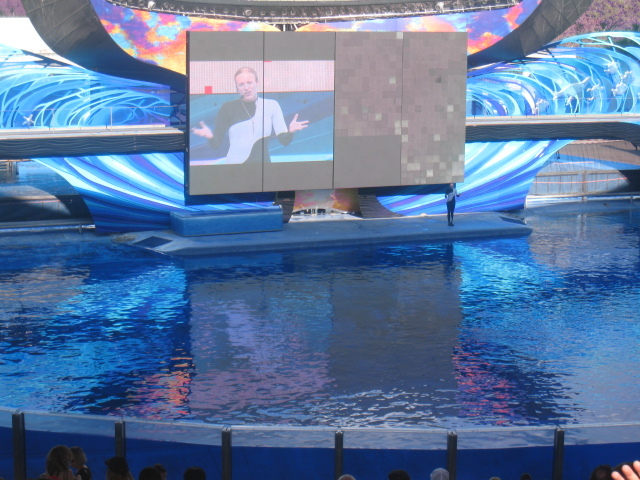 This is a blue-painted structure that grows up from the center back of the tank and overhead, angling down towards the sides. False waves and big bubbles are all around. If the Park is busy be sure to get there early as the stadium gets very full at holiday times. A young girl’s imagination sets the stage for a lovely story of graceful dolphins, ominous false killer whales and a rainbow of exotic birds. There is lots of action throughout both above and under the water. It really is a grand production and there is a lovely fairytale story which is explained in detail at the beginning of the show when the audience are listening intently. It is about a girl who wants so much to swim and fly with the spirits of the sea and the sky. This is all set to the most powerful music. The animals as ever are fantastic and everyone sits mesmerised as they watch the live animal cast. 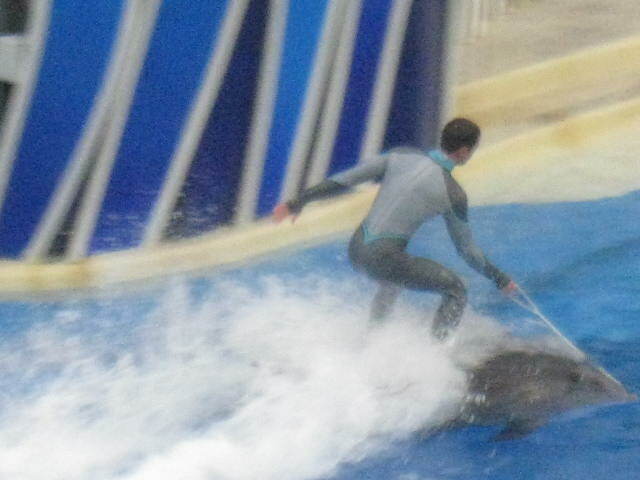 I really enjoy the dolphins but must admit that I am not so keen on the false whales. 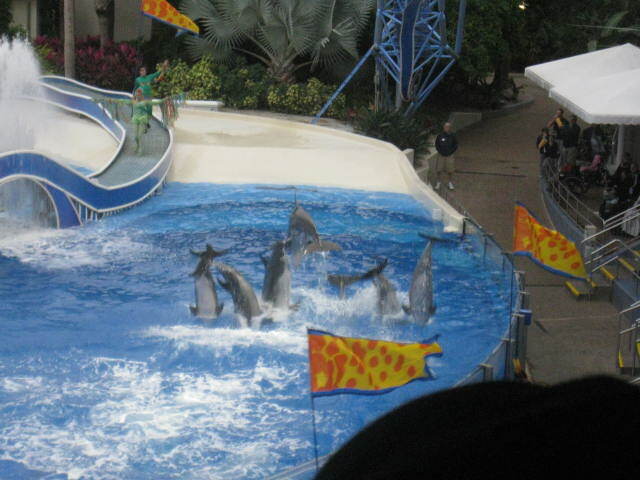 The dolphin tricks included midair summersaults and some of the underwater spirals are very impressive, there has to be great concentration by both the trainer and the animal. There are as ever goodies and baddies in this show and for the first time I was very impressed with the acrobatics. The trapeze artists had superb costumes and they possessed the most fantastic skills, my heart was often in my mouth as they plunged from bungees and soared on swings. The birds are very colourful and appear when you least expect them. If any members of your party are scared of birds just warn them beforehand that they are likely to fly over their heads although you think they may they never fly low enough to touch anyone. 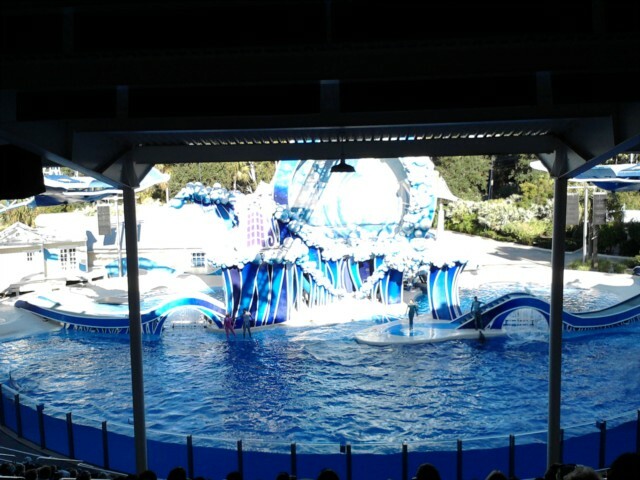 I love this show and when it is finished I usually head over to the Shamu Stadium to wait for the next Shamu show. Viewed 3860 times since 7 February 2009. Fun in Florida - Rides and Attractions.